We had the opportunity to interact with Dr Madana Kumar, the Chief Learning Officer of UST Global- a leading provider of end-to-end IT Services and Solutions for Global 1000 companies. Established in 1998 and headquartered in Aliso Viejo, California, UST Global has operations in USA, India, Mexico, Spain, UK, Malaysia, Philippines, and Singapore. With 14,000 employees, UST Global’s growth and clientele have been impressive. Recently Dr Madana Kumar has won TISS Leap Vault Awards as “CLO Chief Learning Officer Of the Year ” and the team responsible for implementing the learning program – GAMA has won “Global Learning & Development Team of the Year’ in 2014.Here is a transcript of our chat with him. The learning program that was implemented by your team garnered a lot of praise and awards this year. Could you tell us more about it? We have recently implemented an e learning program across the organisation at various levels. It has been successful on various aspects. We were able to increase e-learning penetration by 300 o/o by number of users and e-learning saw an improvement by 127% in terms of number of hours spent by employees on training. All this was a result of our internal branding and marketing efforts. In essence we were able to raise awareness regarding the need for constantly updating skill sets for self-improvement. The awards have only been a recognition of these efforts. What have been the key drivers behind the current focus on learning and development? We are seeing growth on 3 fronts: revenue, head count and geographies. In 2013, as opposed to 2012, we improved headcount by 30%, revenue grew at 20-25% and we also entered 10 new countries. So you can say we are growing at a scorching pace. Growth requires that we are able to provide training to get into new technology areas. Our whole organisation is driven by talent. If we don’t have the right people to deploy, we are lost. We are a knowledge organisation and work on skills of individuals. So constantly updating these skills is critical. There are a number of institutions out there that churn out a lot of students area. However the employability rate is very low in terms of the number of people who could be employed directly. There is a War of Talent to get the cream for your organisation. For experienced professionals also there is a war out there, and companies poach talent from each other. In UST Global, we decided to use L&D to overcome this war for talent. Instead of looking (especially in the technology) out and scouting for talent, we looked at how we can convert the internal talent to meet our requirement. The third driver was how can we do things better while making sure we do it with lesser costs and lesser defects but in a better way. Other drivers also were customer satisfaction and employee engagement. In a nutshell, the drivers for LD are not different from drivers for business. What are the do’s and don’t that HR professionals should keep in mind while formulating L&D plans? Keep the business impact in mind. Do not go with a readymade catalogue of training programs. Start with what business problems are we trying to resolve, and then ask, what behaviours are required to solve the problem, and then look for skills that are required to demonstrate such behaviour. Finally come to learning/ developmental activities required for building such skills. HR should also work on creating the right climate for learning; provide the necessary tools, resources and infrastructure required for learning. Most importantly HR should understand the business priorities and know the trends and thus be able to lead from the front when it comes to proactive skills development activities. 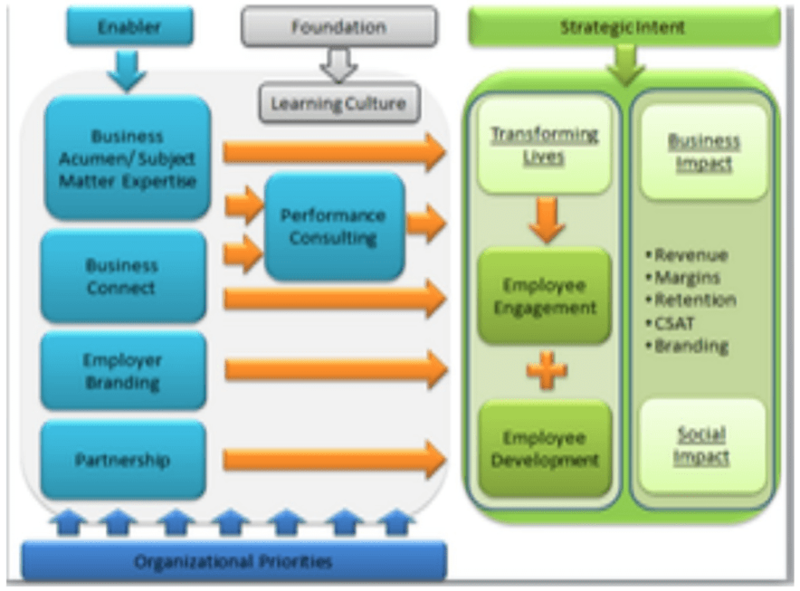 How do L&D professionals get top management buy in for the huge investments required for such initiatives? We in our GAMA team had an integrated strategy to get top management buy-in and to deploy our L&D initiatives. How has the core focus of L&D adapted to current challenges? Urgency/Speed is of utmost importance. We have a turn-around time of 72 hours for L&D needs. Our Performance Consultants find out the needs and we deliver a solution in 72 hours. Other challenges are cost, because the impact of L&D can only be seen in the long run, and automisation of learning programs.